Stand Up Forklift Training, Get Certified Today! Stand up counterbalanced forklifts are most often used to service dock work when workers are constantly loading, unloading, and stacking loads. They help make logistical processes much more efficient and quick, becoming a necessity in many workplaces. When you learn how to drive a stand up forklift with stand up forklift certification, you gain a skill that’s widely sought after in many types of work environments. For both indoor and outdoor work, employers are looking for forklift operators that can drive a variety of forklift types and help their business run more smoothly. If you think stand up forklifts could benefit your business or career, keep reading and learn how to get stand up forklift training for yourself or your employees, and why it’s so important. FLC, the leader in online OSHA stand up forklift training and certification, puts useful resources at your disposal, so you know exactly what to expect on your stand up forklift test. And even in you don’t know how to drive a stand up forklift, our training can show you the basics of safe, efficient stand up forklift operation! 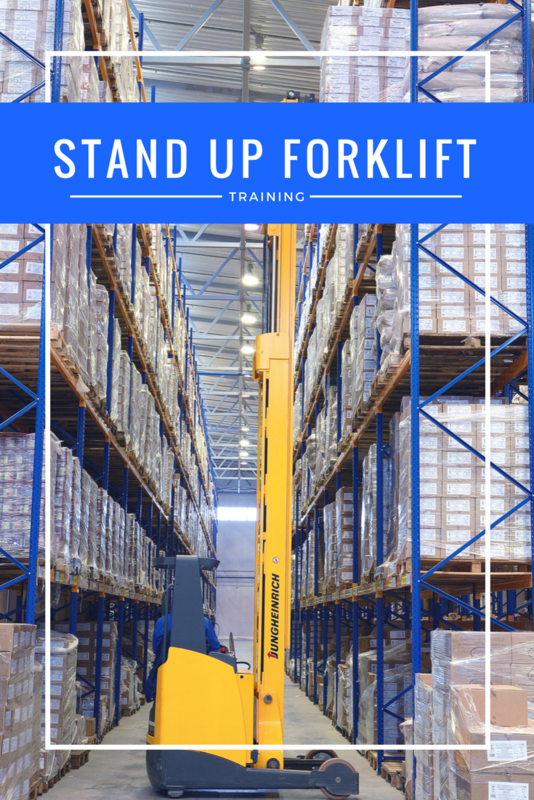 If your company requires stand up forklift training, sign up with FLC today. We provide affordable, OSHA compliant training for any type of operator, and all skill levels. WHAT ARE STAND UP FORKLIFTS? Stand up forklifts are just as they sound. Operators stand while driving them and do not have to sit down and buckle their seat belt. Standing forklifts are very versatile and can accommodate narrow aisles and lift large loads onto the shelves in a warehouse, earning them the phrase “dock-to-stock.” Standing forklifts can handle rough dock terrain, are easy to operate and comfortable to drive, and can take the load directly from the dock to the shelf. Replacing sit down forklifts by learning how to drive a stand up forklift can reduce the time it takes workers to perform tasks, without increasing the hazard risk. A few of the top standing forklift manufacturers are The Raymond Corporation, Fraza Forklifts, 123 Forklift, Comblift USA, Yale Materials Handling Corporation, and Toyota Forklifts. More and more equipment manufacturers are producing stand up forklifts for their many benefits for both the operator and employer. Learn how to drive a stand up forklift with a stand up forklift certification class and become an expert at this productivity-enhancing machine. Stand up forklifts fall into the category of Class 1 Warehouse forklifts, because they’re often used indoors to stock shelves. They are counterbalanced and electric, which means they don’t emit toxic fumes or are loud when operating. According to OSHA, everyone who wishes to drive a stand up forklift needs stand up forklift training. Through written instruction, practical training, evaluations, and content that teaches both truck-related and workplace-related topics, trainees will learn exactly how to drive a stand up forklift, and how to recognize and avoid hazards to prevent accidents. WHAT ARE THE BENEFITS OF STAND UP FORKLIFTS? What makes stand up forklifts different from the other types of forklifts, like sit down models, is that they are often much more convenient and efficient to operate. When a busy day involves constant getting in and out of the forklift, scanning barcodes on loads, dealing with shrink wrap, and conducting quality control measures, driving a stand up forklift that you don’t have to unbuckle and get up and out of each time saves a lot of time and increases productivity. Stand up forklifts are easy, simple, and quick to get in and out of. They allow for the easiest and most efficient transition for workers on and off the forklift, leading to faster working processes, quicker task completion, reduced operator fatigue, and improved productivity. However, it is with proper stand up forklift training that makes these advantages possible, and only through learning the proper techniques for how to drive a stand up forklift that more hazards don’t arise in a workplace. Better Visibility. The more open field of view that stand up forklifts provide offers better visibility for the operator when driving forward and backward. This reduces the risk of accidents that can occur when a driver’s vision is obstructed. If you’re not sure how to operate a stand up forklift, it helps to understand all obstacles that impact visibility. FLC’s training will show you this and much more! Easier Movement. Standing forklifts maneuver easily through warehouses, and can drive through narrow aisles and can swivel and turn with ease when in tight corners. Stand up forklift certification teaches workers how to drive a stand up forklift around blind spots and narrow aisles for maximum efficiency. More Alert Operators. Sitting for hours on end can lead to fatigue and drowsiness for operators, especially if they are constantly having to get up and out of the forklift throughout the day. Stand up forklifts help operators feel less tired and more alert. Better Ergonomics. Stand up forklifts are built with easy-to-use controls, padding for feet and back, and the ergonomically designed chamber for the body of the operator. Each of these unique features equal to improved handling of the forklift and healthier operators who aren’t forced to stay in an uncomfortable position all day. Lower Cost to Operate. Many stand up forklifts are designed with energy-saving features to maximize efficiency and make for a smoother ride to help you run faster and reduce the cost to operate. Once you know how to safely operate a stand up forklift, job opportunities are sure to open up. Sign up with FLC today, and make sure you have the best possible shot at an exciting, well-paying career as a forklift driver! If you’re ready to take your career to the next level by learning a new valuable skill, or you want to improve the productivity of your workplace, get your stand up forklift certification and learn how to drive a stand up forklift. Standing forklift training will teach workers not only how to drive a stand up forklift but also how to perform daily inspections, how to assess the surrounding environment, how to know when repairs or maintenance is needed, and how to recognize and avoid hazards. Stand up forklifts are being used more and more on worksites due to their convenience and time-saving working process. ForkliftCertification.com offers an online stand up forklift certification that teaches workers how to drive a stand up forklift properly and the safety procedures to avoid hazards. In only about one hour and from any device with an internet connection, workers can be trained and certified to operate stand up forklifts. Stand up forklift training is required for any driver, in all situations. If your company is involved in a forklift accident, OSHA will audit or investigate. Without proper credentials, you could see fines of up to $100,000 or more! Included with our forklift training is free three-year renewals. We also offer a Train the Trainer course for experienced operators who want to teach and lead the training for new employees. You can conduct all in-person trainings in-house and streamline the process to make it as efficient and productive as possible. If you’d like both forklift training and the Train the Trainer course, you can bundle and save with our discounted price when you purchase them together. Don’t wait! Sign up for our stand up forklift training today and learn how to drive a stand up forklift in as little as one hour! Choose a training package in order to get started and complete your stand up forklift certification in about one hour! If you don’t know how to drive a stand up forklift, FLC can show you how! And if you’re a veteran stand up forklift driver, it’s always a good idea to brush up on your safety skills. For questions about FLC’s stand up forklift training packages, call us today at (888) 278-8896. No other company offers the online convenience and 100% OSHA compliance – along with lifetime support – you’ll find at FLC. Thanks for considering FLC for you stand up forklift training requirements.